The 200ft cooling towers which served a power station were demolished in 1979 and further parts of the complex were knocked down in 2007. The front of the old building, along the side of the River Nene, which had been left standing, was demolished so the University of Northampton could build their new campus on the site. Kevin Misan, then aged 18, was one of the more than 15,000 people who had turned out to watch the cooling towers be demolished. He said: "I found these shots I took in the pre-digital age of the cooling tower demolition. "The pictures were taken on a Sunday Morning, on a Zenith E film camera and without a motor drive. Not many photographers had a motor drive apart from Chron photographers like Des Richardson and Alan Burman who I knew when the paper was in the Market Place. I worked in Weston’s Chemist in The Drapery and the Chron had an account for photographic materials." He added about the day in 1979: "It was wet, cold and a lot of the town turned out for the demolition. I did not go the following Sunday, but I remember my window frames rattling that Sunday as the shock wave reverberated all they way to Abington." The power station played a key role in World War Two and was a target for Nazi bombers, although it was never hit. One of the turbines in the power station was used to test newly-developed jet engines and their inventor, Sir Frank Whittle, regularly visited the site to monitor progress. The cooling towers and power station provided an industrial backdrop to many Northampton events held on the fields near to Bedford Road. 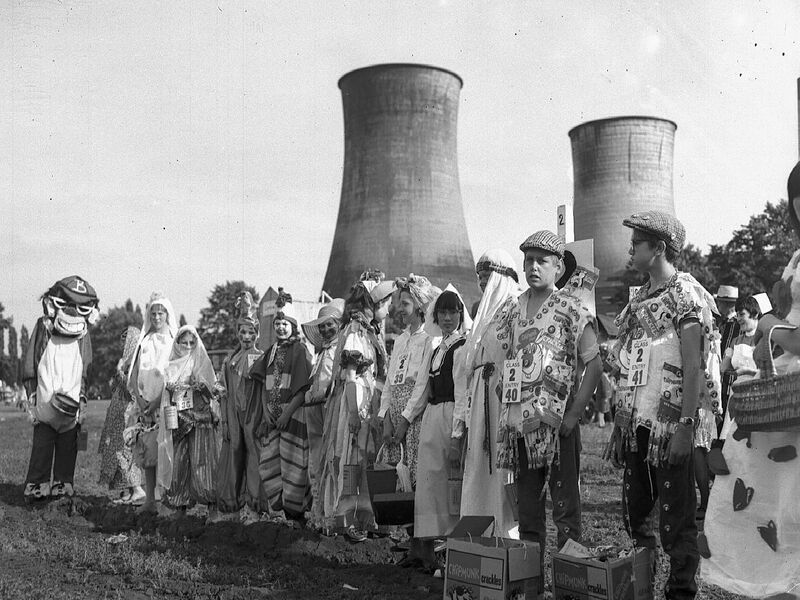 The fancy dress entries for the Northampton Carnival parade gather on Midsummer Meadow on June 21, 1962.